Our friend Jamie Copeland from Western Australia shared this insight. As long as I can remember there has always been an underlying theme in response to safety presentations and safety information. At the age of 17, I started work at a large mine site in the north-west of Western Australia and I remember it vividly. The trainer stood up in front of us at our very first safety induction and said “There’s no such thing as common sense”. I was offended by this statement at first but like most on the mines, I kept my mouth shut, answered the multiple choice questionnaire and got out of there as quickly as I could. The statement is repeated again and again at just about every safety training course or presentation I’ve ever attended and, after delivering safety training for over fifteen years now, I have to admit that I’ve even said the line myself. Why not? Why can’t we have common sense in workplaces? The standard answers to this question are: “common sense isn’t that common”, “common sense isn’t measurable and you have to allow for the lowest common denominator” (in other words, most of the time make most of the people feel like you think they are stupid) and “I’ve been around too long and have seen too many incidents and injuries to rely on people having common sense”. It is a fair response in some ways. A lot of people make incorrect decisions often which they sometimes get away with and at other times, this causes an incident or an injury or even death. The times when they get away with this behaviour reinforces the belief that it’s acceptable which then can allow an incorrect practice to become the common practice. We then have juniors learning from these people and the cycle continues until an incident or injury occurs which forces the practice to change or some sort of education or system is put in place to correct the practice. Safety is all about education but you don’t need to be book smart to work safely. Every employee comes across safety risks in their workplace and most of the time their ‘common sense’ keeps them safe. Unfortunately some of us have been taught by excellent teachers in their fields of expertise and others have not which then exposes some to unknown risks and dangers, to quote an old boss of mine “they don’t know what they don’t know”. providing group ownership and mentorship when it comes to safety practices. One way to do this is by creating custom-made, pocket sized, safety guide books for your employees by quickly and easily selecting from a range of safety-related articles that suit your industry. Log into our website (www.tailoredsafety.com), download your company logo and put together a guide that best suits your people, using information from accredited and experienced safety trainers / advisors. The process can be finished in a couple of minutes, after which you can view a copy of the pocket-sized book on screen before making changes or sending it to be printed. The book then resides with the employee, they have basic safety information on a number of different subjects as selected by the client on their person. In other words, they have a base level of what they are expected to know in the workplace or “common sense”. This resource book is pocket sized and can easily be taken to the workplace, it isn’t a bulky procedure and it’s not locked on the computer screen. It can be reviewed whenever the employee feels they need to or want to. There is a risk however that these books can be shelved and forgotten, hence the need to involve them in the workplace and provide mentorship and ownership. It is suggested that the book be used as a resource for toolbox meetings. An article each week or day or month (whatever the workplace format) can be selected and discussed at the meeting. This then takes the “common sense” and makes it even more common as the information and materials are confirmed and discussed in the workplace. This can also provide clients with the opportunity to review existing procedures to ensure they are up to date and aligned with the latest standards. By using this format, the likelihood is, there will have less personnel not knowing the vital safety information in your workplace which will keep them safe and your business less likely to be impacted by incident or injury. Please note, this book should not replace your existing safety system, it should not replace your safety inductions, it should not replace your risk assessment, the goal of Tailored Safety Solutions Pty Ltd is that we complement your existing systems with a new resource which can be used in the field and generate more discussion about relevant safety topics to your industry. Of course, after reading all this, you will want to know how much it costs. At Tailored Safety Solutions Pty Ltd we believe that small businesses and large businesses need this resource and in order to cater for this we charge a flat rate per book of $21.50. 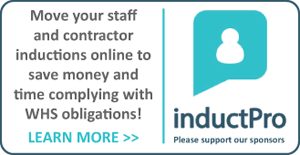 This is a small investment in each of your employees which can potentially reap huge returns and peace of mind and even provide some protection to employers if an incident was to occur.